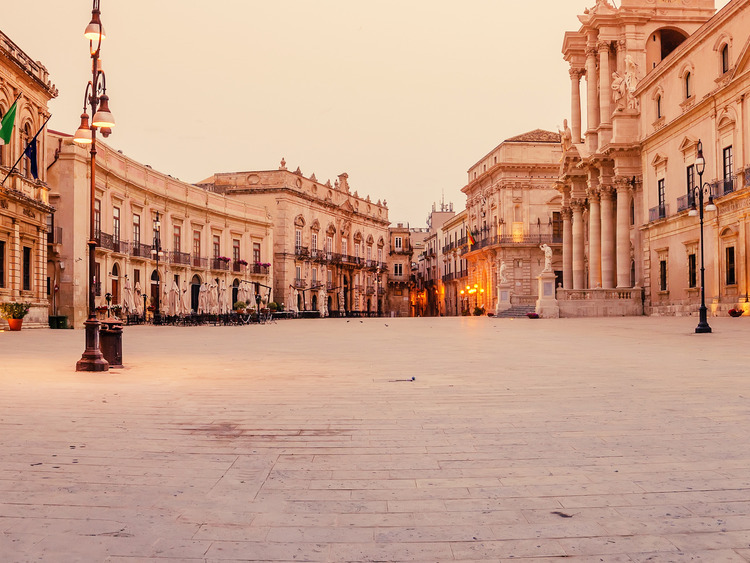 A journey through three thousand years of history in one of Sicily's most beautiful towns, one of the few in the world to have two UNESCO World Heritage Sites: its Greek ruins and Baroque masterpieces. On leaving the port, we will set off towards the Neapolis Archaeological Park, located in the north-west of the modern city, where we will be able to admire what remains of Greek Syracuse. Founded in the 8th century BC by the Corinthians, the city was one of the richest and most powerful in the Mediterranean, as demonstrated unequivocally by the monumental ruins of this exceptional site of historical and artistic interest. We will visit the imposing Greek Theatre, built when the splendour of the ancient polis was at its peak. Carved partially out of the rock with an extremely large cavea, it was one of the most famous theatres of the ancient world. Our next stop is the ancient stone quarry known as the Paradise Quarry. Several earthquakes have caused the collapse of the roofs of the large caves dug to extract stone and the quarry is now open to the elements. Its floor is covered with a lush citrus garden that offers picturesque views. The northern side of the quarry is home to a large crevice, opened up by the ancient quarrymen. Caravaggio called it the Ear of Dionysus because its shape is similar to that of an ear. We will go into the cave to appreciate the special acoustic effect that has made it famous all over the world. Since the late 18th century, it has been a destination for travellers, who were fascinated by the charm of this unusual place. Next, we will visit the Island of Ortigia, the oldest part of the city of Syracuse, which is home to ruins of ancient Greek constructions where the line between myth and reality becomes very thin indeed. Our next stop is the Arethusa Spring, the mythical backdrop for the tragic love story between a nymph and a hunter. We will then wander the narrow streets towards Piazza Duomo. Once again, it almost feels as if we could reach out and touch ancient history as we look up at a Baroque masterpiece: the Cathedral of Syracuse, built on the ruins of the Temple of Athena, the Doric columns of which are still visible today. The transfer to Syracuse takes approximately 1 hour.